The year 2018 has thrown up a lot of surprises and moments of magic for the footballing fraternity to witness. Confining to the aforementioned, the English Premier League 2018-19 season hasn't been an exception. For the first time in ages, there were three unbeaten teams after 10 matchweeks and two, after the commencement of the 15th matchweek. Inflated transfer fees, the number of quality English talent and the ruthlessness of the likes of Manchester City and Liverpool have added another dimension to the Premier League. While the season started off with as many as six teams capable of winning the title, it was always going to be a memorable season. The introductions of Unai Emery and Maurizio Sarri have only added value to the EPL's moniker, "The Best League in the World". With the settling in and the table beginning to take shape, here's the Premier League Team of the Season so far in the 2018-19 season. Inspite of his blunders against Leicester City and recently against Manchester United, Alisson has come a long way in justifying his price tag after Liverpool initially broke the transfer record (for a Goalkeeper) to acquire his services from Roma. Alisson's long range passing and command of the defensive line has made him an invaluable asset in Klopp's arsenal of stars. He has not withered due to the pressure of his price tag and has put up extraordinary performances against the likes of Chelsea and Manchester City. 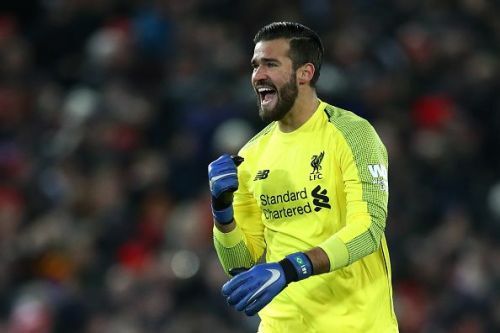 While Liverpool have been bulldozing oppositions, Alisson has been alert while doing his job with as many as 36 saves to his name and only seven goals being conceded by the Brazilian. With a league high 10 clean sheets to his name, the Kop faithful will be praying for Alisson to keep up his performances as they try and pull clear of Manchester City at the top of the table.